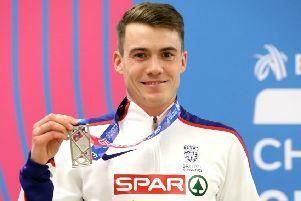 Guy Learmonth is looking for a smooth ride through this weekend’s European Indoor Championships after revealing how his latest bumps and bruises almost wrecked his hopes. With the showpiece kicking off today at Glasgow’s Emirates Arena, the Lasswade ace will pray for safe progress through tonight’s 800 metres heats to set a captain’s example for the rest of the Great Britain and Northern Ireland team. But it’s taken a lot of support to reach the starting line with the broken finger he sustained following his mid-race crash at last week’s Grand Prix in Birmingham just the start of his problems. “The worst thing is I did some damage to my rib cage as well,” he said. “I tore an intercostal muscle in the fall but, with all the adrenaline, and the pain in my hand, I didn’t really notice it too much until I raced in Dusseldorf a few days later. “I just thought I had a pain in my back or some tightness. That night was all about getting around in one piece but I was really struggling to breathe. I got to about 10.30pm, a few hours after the race, and I got onto the phone to my dad. The 26-year-old has been ordered to meditate every day this week to relive some of the stresses but a perfect rehearsal run at the Emirates has him believing he can emulate Scottish legend Tom McKean by claiming the title on home soil. “My body is good,” he said. “It’s just a few extra additions thrown in. But then I do like a little drama in my life. “And a wee rib problem won’t stop me racing. I just need to be smart. 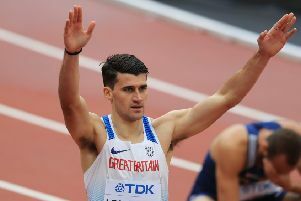 It’ll take three perfect races over the three days to come out on top, Learmonth concedes, but he’s under orders from his coach Henry Gray to learn from his best-ever championships – the 2015 Euro Indoors in Prague when he ended up sixth. “Henry told me to go and watch my races from Prague,” he confirmed. “Especially the semi-final. That’s how I have to run these championships, moving as smooth as possible in the rounds and then to get to the final and let fly. Learmonth’s one of nine Scots in the 49-strong British team with Laura Muir gunning for 3000m glory this evening and Katarina Johnson-Thompson looking for pentathlon gold. This afternoon, Edinburgh AC star Chris O’Hare will begin his hunt for a second Euro Indoor medal in the 3000m where he’ll aim for a twin assault with team-mates Andy Butchart and Sam Atkin.